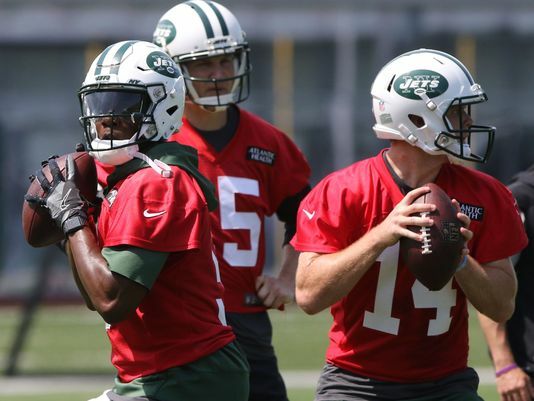 Whether you want to believe it or not, the New York Jets are FINALLY in a “positive” QB situation heading into the season. They possess a veteran in Josh McCown coming off a career year, a former first rounder in Teddy Bridgewater who just had an excellent preseason, and No. 3 overall pick Sam Darnold who is apparently “NFL-ready” at only age 20. FIRST: I think the Jets should trade Teddy Bridgewater. I’ve always been a huge Teddy fan since his Louisville days, and I think he’s a Top-20 QB in this league at full health. After a dominant preseason and training camp showing, the Jets should deal him now while he’s young, reportedly at full strength, and with a sky high value. The Jets are not looking for a postseason run this season, and should certainly value a potential FIRST ROUND pick for Teddy more than an extra 1-2 wins with the former Viking at the helm. WITH THIS, I think the Jets should start Josh McCown. While Sammy has all the hype and is probably NFL-ready indeed, there’s ZERO POINT in rushing him at only AGE 20 with a terrible O-Line, and proven veteran in McCown behind who could continue to teach him the ropes better than anyone else, and win the Jets games. Remember, McCown quietly had a top-20 season last year with Gang Green. Until we see any old-man decline in Josh (who also looked great this summer), he should be the guy with Darnold patiently waiting behind to shine. What are your thoughts? Who should start?